La Wis Wis Guard Station cabin was built in 1937, and is an important piece of Gifford-Pinchot National Forest history. It is one of only two structures of its design in the region. 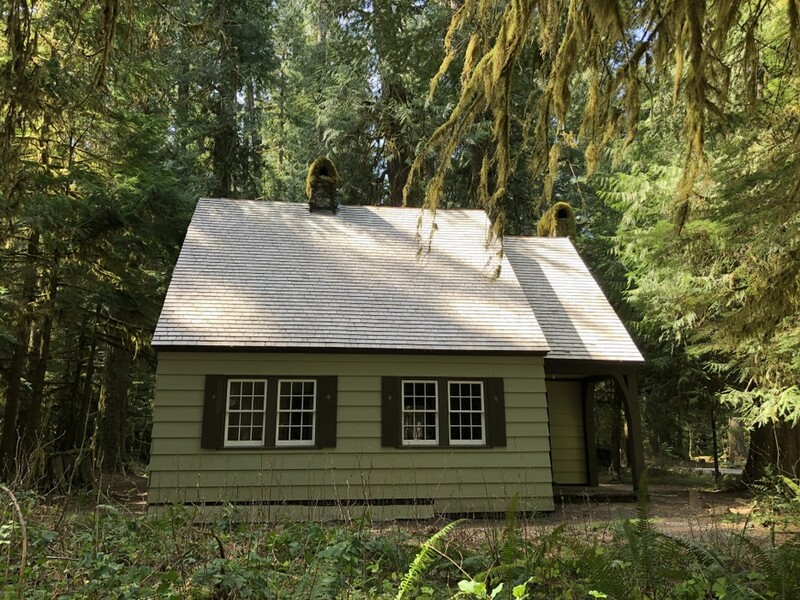 The cabin is situated in the beautiful La Wis Wis Campground, just off US Highway 12, in the Cascade Mountains near the southern entrance to Mount Rainier National Park. Old-growth cedar and Douglas fir tower overhead, and the Ohanapecosh River and Clear Fork of the Cowlitz River create an idyllic setting. Three separate Wilderness areas are also in the immediate vicinity. The building is listed on the National Register of Historic Places (NRHP), and constructed as a Civilian Conservation Corps (CCC) works project. The 25’x32’ guard station embodies the distinctive characteristics of the Northwest “Rustic” style, typical of Forest Service, Depression-era architecture. This style design incorporates horizontal cedar siding, a tall gable roof with board-and-batten gable ends, exterior stone chimney, and distinctive multi-light windows. The cabin was used as an administrative residence until it went into disuse in the 1990s. Since then, it has been subject to water damage and moisture problems. The La Wis Wis Guard Station PIT project began in 2012 as the first part of a multi-year restoration and rehabilitation effort to prepare the cabin for future use. That year, project team members undertook a variety of activities including the replacement of roofing material, repair of the interior flooring, and repair of foundation components. In 2013, we removed the damaged original, knotty pine, tongue-and-groove wall paneling to prep for rehab, removed the old wiring and plumbing, and repaired the flooring. In 2014 and 2015, the knotty pine wall paneling was stripped of non-original paint and refinished. The paneling was then re-installed in the guard station and we undertook further interior work, including plumbing and electrical. Continuing in 2016, we reproduced in-kind trim and moldings, installed additional wall paneling, and did window rehabilitation. In 2017 we followed up with repair and rehabilitation of the kitchen cabinets and countertop, reproduced an in-kind door casing and door, and during the second session painted the kitchen interior, re-glazed window panes, installed the door and other associated hardware, and installed kitchen roof and wall panels. The 2018 volunteer efforts included rehabilitation of light fixtures, interior door repairs, in-kind reproduction of an exterior door and additional trim, wall and ceiling panel installation, painting and installation of repaired and restored features. During the 2019 project, volunteers will continue restoration and rehabilitation efforts according to the Secretary of the Interior’s Guidelines for Restoration and Rehabilitation. One session is planned, lasting four days in duration and working 10 hour days. This session will take place on-site at La Wis Wis Guard Station. Work will involve installation of flooring in the main living areas, adding insulation upstairs as well as installing wall and ceiling panels in the upstairs, re-plastering the kitchen chimney, additional plumbing, and installation of an on-site propane tank. Again, we certainly have our work cut out for us in the on-going effort to preserve this unique and rare historical property. The project and its participants have added to the storied local history of La Wis Wis Guard Station and returning the guard station to a usable state is well within grasp! We will continue this tradition and dedication in 2019 – we hope you will join us in the effort to put this incredible historic resource back into use! Facilities: Onsite tent and RV camping provided at no charge at La Wis Wis Campground; water, vault toilets, picnic area; no hookups; other camping options available in the greater area at volunteer expense; Randle, Packwood, and Morton are full-service communities with motels/lodges, B&Bs, restaurants, and a range of other amenities; volunteers are responsible for own lodging/personal camping equipment, food, and transportation. Off-site showers located in Packwood will be provided at volunteers’ request.